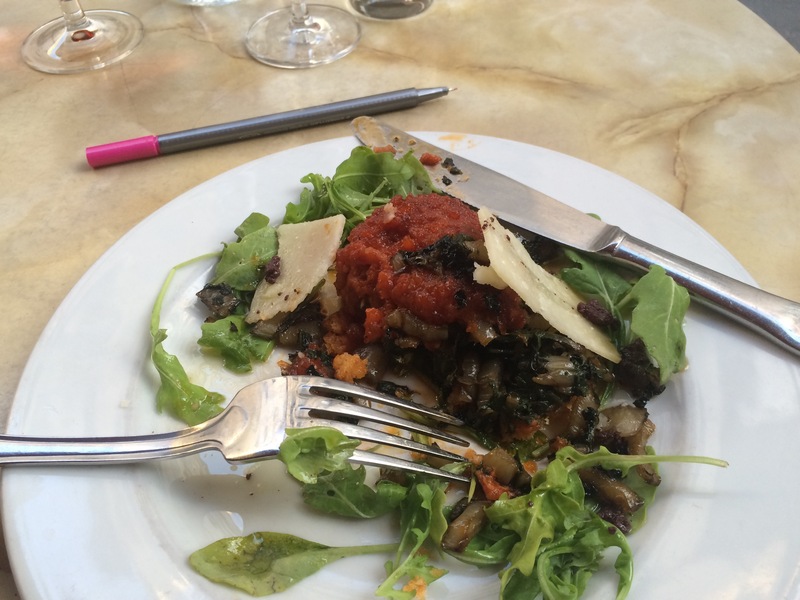 It being my last night in Paris and close to the last before my pilgrimage, I thought it appropriate to mark the occasion with a last supper of sorts -however when in Paris who ever really needs an excuse? While I’m out walking during the day, I often come across places that I might return to. They may take the form of an extra special earring shop, a stunning piece of graffiti art that I didn’t catalogue with my camera, or a traditional French restaurant. Bistro au Vieux Chêne fell into the last category, and I decided when walking past it during the day, that its decor, menu and ambience were perfect. I can’t emphasise enough the impact of decor and ambience in a restaurant. For me, it needs to look settled, confident and welcoming. I believe these qualities mirror the food that gets produced and the service that is offered. The restaurant doesn’t necessarily need to be open for you to get these impressions. When I passed it during the day on one of my walks around the 12th, I could tell from the planter boxes outside, the traditional tables and the name, that this place would be a pleasure to eat at. I needed to check it would be open on the evening of my last supper, so during the day I visited again. My assumptions about the kind of bistro it was were confirmed, when I came across the staff sitting outside preparing with the host, their work for the day. One of the waitresses (who served me at night also) shared a joke with me when I asked for a menu – she detected an accent and also offered one in English. I didn’t actually pay much attention to the menu, just my budget. On that basis I asked what time they opened for dinner – and so returned just after 8pm that night. My host kindly asked whether I minded being seated at the wobbly table next to the pot plants outside, and I was happy to oblige. As is usual practice for restaurants, there is often a reduced price for a set menu, and the eligible dishes are marked on the menu. I like to eat well, so of course I chose 3 courses. 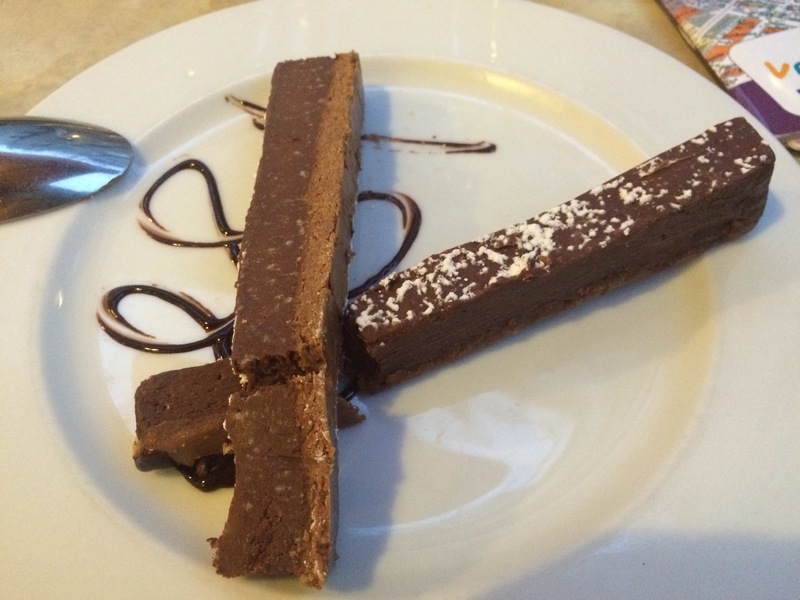 Who can do without dessert? Since trying Kir (wine and cassis) and Kir Royale (champagne and cassis) on my very first visit to France, I have always enjoyed it, so I chose it for the night again. To accompany it, and in addition to another basket of bread, little profiterole triplets dribbled with cheese arrived as well. They were the most delicate I have ever tasted. I asked what the sobresada was and was told that it was like chorizo. I was imagining a dish with chorizo as we have in Australia, big chunks of sausage. This was nothing like it. There was just a hint of the sausage flavour and the whole dish was very light. 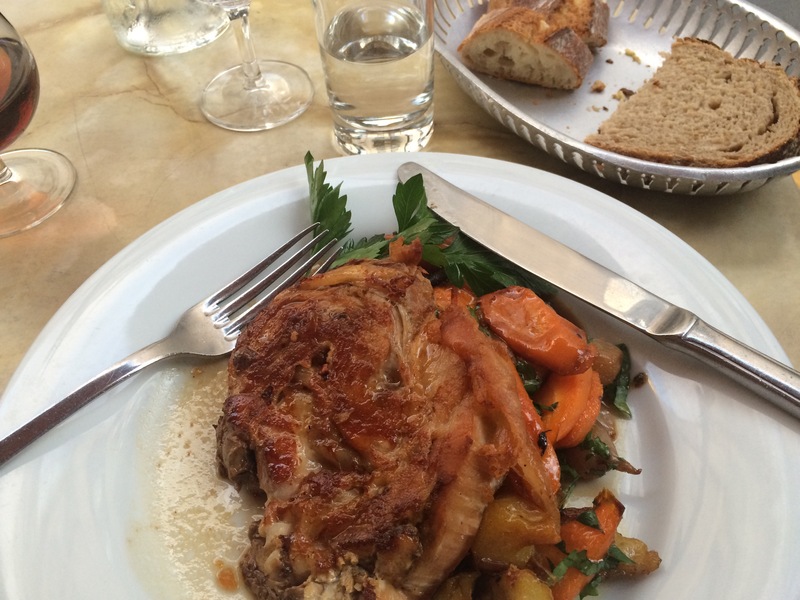 The veal was tender in texture and flavour and the small carrots, baby onions and potatoes were so fresh and equally as tender – perfect with the parsley decoration. A beautiful dessert that I ended up taking half of home for leftovers, it was so rich. Et surtout, pour le gout! In my basic understanding of French – ethical cuisine based on agriculture which respects the environment, builds relationships with passionate suppliers, is seasonal, of high quality and fresh. Most importantly – it tastes good. 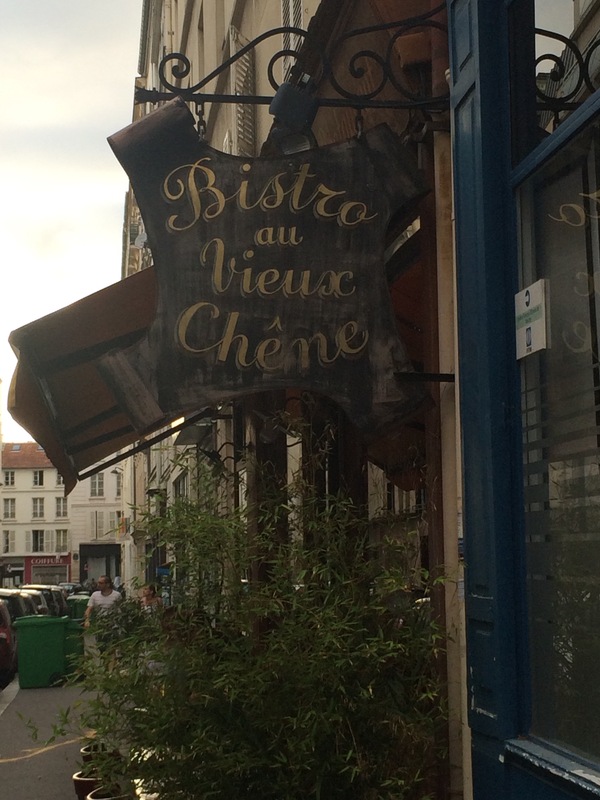 I have now looked up the meaning of the name, Bistro au Vieux Chêne. It means bistro at the old oak. Given I spent many hours climbing the old oak trees in the front yard at my grandparent’s house, I now know why this lovely restaurant satisfied my need for settled, confident and welcoming. 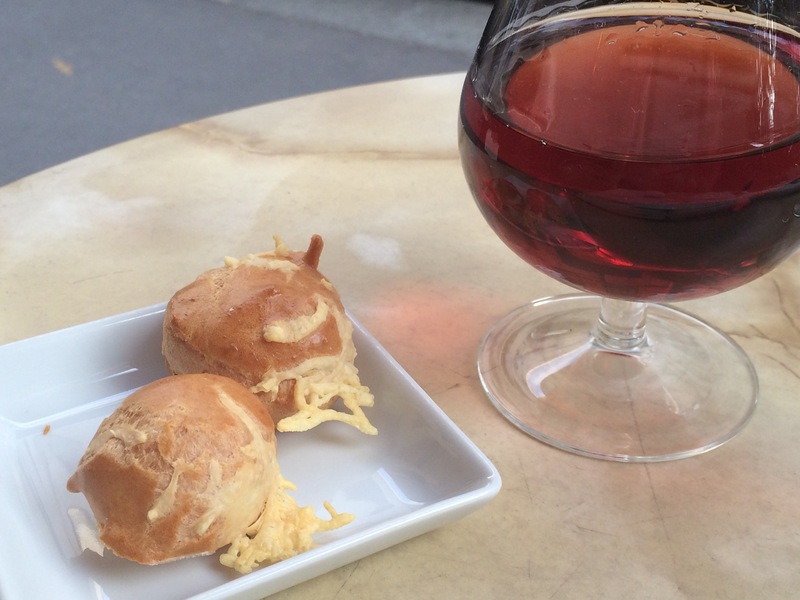 This entry was posted in Food, France and tagged 12th arrondissement, Bistrot au Vieux Chene, Eating in Paris, Kir Royale by bronwhy. Bookmark the permalink.